Local metal shows in India have experienced a less than enthusiastic response of late, in the wake of somewhat regular performances by more renowned international bands. Local DIY endeavours find it hard to compete with professional event management agencies that bring down the big names; the latter boast of good production values and usually offer a satisfactory return on investment. One likes to think that India’s peculiar metal subculture, consisting of an overwhelmingly urban, English-educated middle class, wants to support homegrown acts; if anything, illiterate statements to the effect of bad bands like Demonic Re$urrection “making India proud” abound among the clueless. Organizers, however, have rarely managed to put together a bill containing enough quality bands. Which, in turn, isn’t entirely their fault, for hearing and scouting for good Indian metal is an aggravating experience at best; there are precious few bands that are capable of retaining a uniform vibe faithful to their genre of choice (see Cosmic Infusion song below for terrible core ruining what could otherwise have been a decent synth-driven folksy melody). Organizers make it worse by trying to appeal to every-man in the audience and so shows regularly become an unpalatable blend of disparate genres that test the mettle of even the most gung-ho of scenesters. Most get wasted or simply walk out as the music degenerates into a weird mishmash of chugs and hand-slams. Dark Desolation: This band plays raw Norsecore-styled black metal extremely high on physical endurance. On the evidence of past performances, Dark Desolation can be relied on to provide a tightly executed set of relentlessly tremolo-picked black metal. 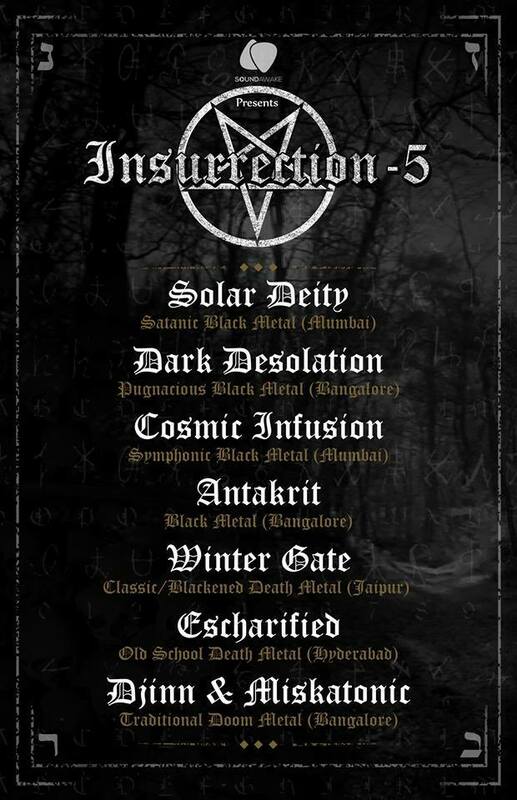 Cosmic Infusion: Theatrical band from Bombay City that wants to play old Dimmu Borgir-type keys-laden black metal but inadvertently slips in more prosaic metalcore influences. They could yet grow into providing a genuine, unabated atmospheric experience but they have to iron out these annoying chinks first. Winter Gate: Winter Gate come from the metal backwater of Jaipur, the city of pink palaces, both literally and figuratively *wink* *wink*. Strangely enough, they play a melodic form of death metal with a very distinct early European sensibility, and they do it well too. The art on their EP may hint at an Opeth influence but these guys sound better than their more acclaimed idols ever have. Escharifed: One of the more promising young death metal bands in India, Escharified are influenced by the good stuff and bring an unabashedly India-centric, nationalist slant to their music, a refreshing change in a scene filled with politically-correct girly men. Djinn And Miskatonic: Black Sabbath influenced modern doom isn’t the most enticing of propositions but DnM are one of the few bands that do it well. Ascetic vocals from the pulpit and serpentine riffs that vary nicely between tempos, together with an interest in weird fiction and film, adds an extra layer of mystique to this band. Antakrit: Antakrit are a new band on the Bangalore scene and appear to play a form of crusty black/thrash well versed in the rudiments of the genre.